As soon as the temperature rises and humidity increases, the threat of heat exhaustion will begin to set in. Your normal morning at the dog park can leave your pup dehydrated and uncomfortable and if you’re not careful, it can even be dangerous. So instead of accidentally putting your pooch in harms way, follow these 10 tips to ensure that both you and your dog are prepared for the hot summer heat. Another great way to ensure to ensure your pup is comfortable in the sunshine is to whip up a batch of homemade peanut butter popsicles for your fur baby. Just like popsicles are a refreshing treat for humans, these tasty treats will hydrate and cool down your pet immediately. And of course, if your dog isn’t a fan of peanut butter, just add some ice cubes to their water. You can also keep your pup cool by giving them a cooling body wrap, vest, or mat. You can soak each product in cool water and your pup will be able to stay cool for hours, so they are perfect if you need to leave your dog unattended for a few hours. Military dogs in hot places like Afghanistan wear cooling vests to keep cool during combat on hot days. Just like humans, overexposure to the sun’s harsh UV rays can give your dog a painful sunburn, which can lead to peeling skin, uncomfortable inflammation and an increased chance of developing skin cancer. A dog’s fur can provide some protection, but it’s never as much as we think it is. Areas on dogs that lack pigmentation are extremely susceptible to developing sun damage, which is typically on the lips, tips of the ears, and along the nose. There are formulated sunscreens available for dogs, so to ensure that your fur buddy is always protected, have your veterinarian to suggest the correct solution for your pup. Pets react very differently to heat than humans. Dogs, for instance, sweat through sweat glands that are found in the pads of their feet. This means that a fan won’t cool a dog down as effectively as it would a human. It’s very important to refrain from walking your dog during the hot hours of the day. It’s best to walk your pooch either early in the morning or later in the evening when the sun is less harsh. It’s also important to avoid walking on the cement and instead walk your dog on grass or dirt to avoid burning your pup’s paws. If you’re ever unsure if a surface is too warm, press your hand onto the surface for 30 seconds to test it before allowing your dog to walk on them. If it is painful for you, it will be painful for your dog. 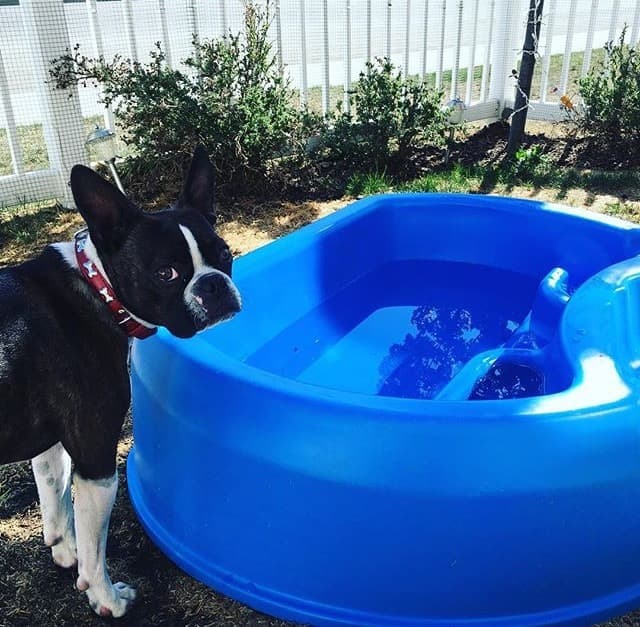 Just as humans love to cool down on hot summer days, your furry pet would love to as well — so purchase your dog a small children’s swimming pool. It’s an inexpensive way to cool down your pooch and they’ll really enjoy it. Make sure to fill the pool up midway so your dog can comfortably lie down and cool off, while still keeping their head above the water line. Regardless if you're running errands, relaxing at home or going for a walk, you need to ensure that your pup is hydrated at all times. When you’re at home, you need to keep your dog’s water bowl in the shade, so you can avoid their bowl heating up which could lead your dog to burn its tongue. If you’re running errands or going for a walk, make sure to carry an extra bottle of water with you and a small dish so you can stop and hydrate your pup whenever they show signs of being thirsty. It doesn’t matter how many dogs have tragically lost their lives after being left in a parked vehicle, people still forget how terribly dangerous this is for your pet. On a warm afternoon, temperatures inside a vehicle can rise rapidly to lethal levels. According to a report by the CBC, in the first ten minutes after the doors are shut on a vehicle, even if it’s been air-conditioned, the temperature rises about 10 degrees Celsius. So if it’s 30 C, that means the car can get as hot as 40 C in a quick ten minutes. This can cause your pet to suffer from organ damage or unfortunately, die. Ticks, fleas, mosquitoes, flies, and other insects are at their peak during the warm summer months. Talk to your veterinarian about appropriate protection such as collars, sprays, shampoos, and other products to ensure that your pup is always comfortable and protected. Finally, to ensure that your dog has a safe and happy summer, you need to know how to spot the signs of heat exhaustion. First, you need to know that there are a number of factors that can make a dog more susceptible to heat exhaustion, which can include age, breed, coat type, physical condition, and the climate that it lives in. Both young and old dogs are the most at risk, while brachycephalic dogs (those with short muzzles), such as Pugs and Bulldogs, are also at greater risk. Symptoms of heat exhaustion or stroke can include excessive panting, disorientation, and obvious paleness or gray gums due to a lack of oxygen. If you ever feel as if your dog is suffering from heat exhaustion or heat stroke, act immediately by submerging her in cool water (not ice cold) or by placing ice packs on her neck. Once the dog has been stabilized get it to a vet as soon as possible. wonderful publish, very informative. I&#8217;m wondering why the other specialists of this sector do not realize this. You should proceed your writing. I am sure, you have a great re#&8rsdae217; base already!